Lori McGrew, professor of Biology, took six students to the Annual Meeting of the Society for Neuroscience which drew more than 30,000 neuroscientists from around the world to San Diego, California. 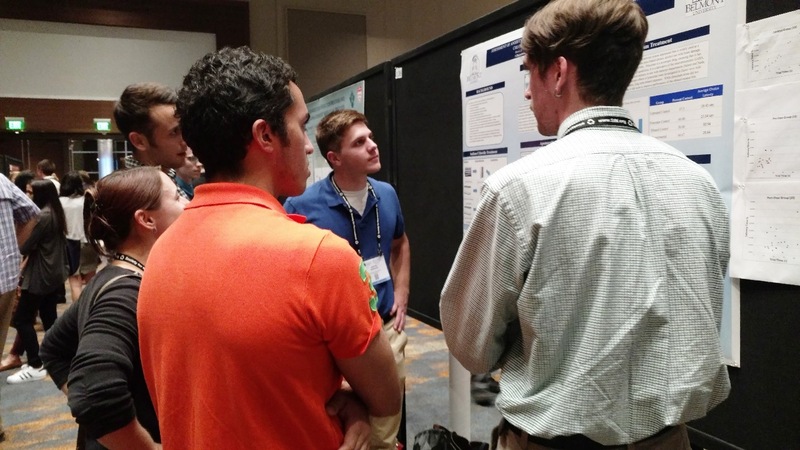 The students, Austin Demaagd, Curt Brown, Mohamed Darwish, John Longenecker, Stephane Morin and Sam Zacovic, presented their research at the Faculty for Undergraduate Neuroscience Poster Session. Their poster, “Assessment of Anxiety and Working Memory in Danio Rerio Following Treatment with Sodium Chloride, Apomorphine, Isoflurane, Ethanol, and Piracetam,” detailed the findings generated during the Belmont Summer Scholars Program. During the program, McGrew led a group of students through research utilizing Danio rerio (zebrafish) as a model organism that focused on assessment of anxiety or memory in the fish. In addition to discussing their own work, students had the opportunity to meet other neuroscientists and learn about the latest discoveries and techniques. Other zebrafish researchers shared data about changes in neurotransmitters that result from socialization and social structure, using fractal patterns to detect movement disorders and the pharmacology of sleep-wake cycles. The special lectures included Mu-ming Poo’s “Random Walk in Neurobiology,” Thomas Albright’s “Reforming Forensic Science: Insights from Research on Vision and Memory” and Christopher Reeve stem cell research data blitz.